These pages are for students who have taken part in the NSS / NASA Ames Space Settlement Contest. All space settlement students will be given an opportunity to present their projects during a Poster Presentation session. Selected student teams will be given a chance to compete for one of the several 10-minute slots available to give an oral presentation to the many scientists and commercial space conference attendees. NASA Ames Space Settlement Contest Students may give oral and poster presentations to the professionals and enthusiasts at the conference—adults and students alike. 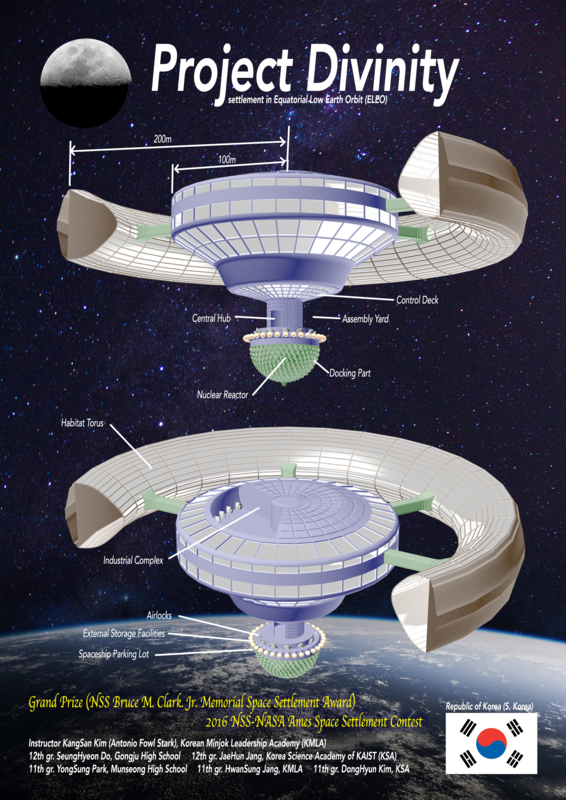 The NASA Ames Space Settlement Contest Students will receive their awards at the Awards Ceremony on Sunday, May 28th, at 2 p.m. The Grand Prize Winners will have the honor of presenting at the Sunday Gala dinner. Due to the limited number of slots available, students wishing to give a 10-minute oral presentation will need to submit a video of their team presenting their project. Students will be pre-selected to showcase the most inspirational, creative, and future-spective projects. Students who wish to participate must apply through this link. Any questions regarding the oral presentation is to be sent to [email protected]. Also review the Oral Presentation guidelines. Please note: your video must be recorded, uploaded to your choice of streaming host, and shared through a publicly-viewable link; this is so all of our judges can access your videos without having to share and download larger files. Each space settlement student team will be assigned a poster session day and time during the conference. Teams are expected to stay aside their posters and communicate with conference attendees. This year, we will be judging your space settlement project posters for some prizes. In past years, some of the posters have been absolutely beautifully laid out and very inspirational. We want to honor and celebrate these futuristic creations. The awards ceremony is Sunday, May 28th, 2017, 2-4 p.m. The VIP Keynote will be presentation TBA. The Ceremony will be followed by the “Shining Stars” photo opportunity. Students are required to wear business or ‘dressy’ attire for the ceremony. The Grand Prize Winners will present at the Sunday Gala Dinner. People who want to attend the dinner will need to use a secondary registration for the dinner ticket. However, if you only want to see the student presentation and not partake in the Gala Dinner, you may come in and sit at the back of the room when the dinner ends. As the Gala Dinner is a special event, a formal attire is required.